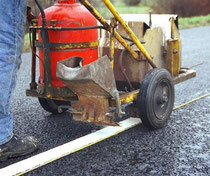 The thermoplastic flows on to the road surface and is spread to the required width and depth by a small screed plate. It is the skill of the operator pushing the "trolly" at the correct speed according to the heat and viscosity of the thermoplastic that will achieve a consistent road marking of the required width and thickness. It is also necessary to point out that the nature of the road marking industry in the UK is such that the majority of operators are often self employed working "on contract", almost a franchise arrangement, to the main company. This results in the situation that the more "line" they lay with provided equipment and product, in a minimum time, the more money they will earn. Yes, the glass bead hopper is a bit "bashed about", but it is still functioning and if you look really close, especially in the enlarged image you can see the the glass beads being spread on to the molten, newly laid, thermoplastic road marking.